Have you ever had Morning Glory Breakfast Cookies? Or maybe morning glory muffins? They are very similar to carrot cake muffins or carrot cake breakfast cookies. Today I am super excited to bring you this particular morning glory recipe since it’s totally grain-free! I used chickpeas as a base and they turned out great. 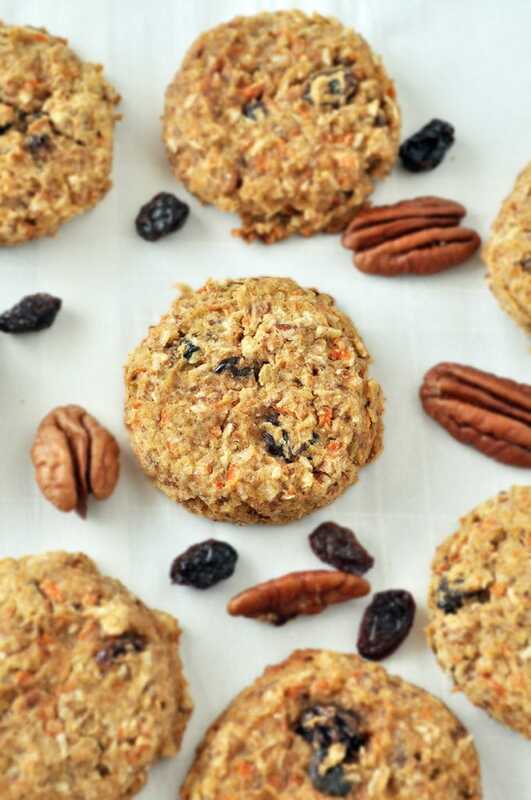 These healthy breakfast cookies have very little added sugar. There is only 1/4 cup maple syrup in the entire recipe! They are vegan, gluten free and grain free! You can easily make these nut free by using sunflower seeds instead of the pecans. The perfect healthy breakfast cookie! The cookies look delicious and fabulous portable!!! Wow, so creative to use chickpeas. Love this idea for a quick grab and go breakfast! I love having easy breakfast options like this on hand for busy mornings! Do I drain the chickpeas or dump in brine too? Thanks! I have chickpea/garbazo flour. would that work? if so, how much should I use? That might work too, although I am not sure how much to suggest. I just made them & they came out great! Thanks for the recipe. You are so welcome April! Glad you liked them! Can they be made without a food processor? I have a mixer and an old Oster blender. I'd like to try them. Thanks. You might be able to mix beans in the blender and then transfer to the mixer for the rest? Wow - Im always looking for ways to add a bit more protein to breakfast without relying on nut butter - I cant wait to try these!!! Thanks for a great recipe! My cookies turned out perfectly. I added a tsp of vanilla to the recipe and baked on parchment paper. Yum!! Why bother making a flax egg when you can just use the aquafaba from the chickpeas, rather than throwing it away? That's a great idea! I actually made this recipe before I knew about aquafaba. I just made these and they turned out great. I added a half teaspoon vanilla. A great treat when I’m trying to get on track with healthy eating in the new year!